This Slow Cooker Hawaiian Chicken is the perfect combination of salty and sweet and is sure to please even the pickiest of eaters! Seriously, this bunch of young people is awesome. First of all, some of these kiddos have very well-deserved black belts by age 9 (!!! ), and to watch what they can do with a bow staff/nunchucks/swords kind of blows my mind. I’m not sure what I was doing at that age, but I’m pretty sure it wasn’t backflips and jump-kicks higher than my head. Not only that, but every single kid in this group is kind and supportive and willing to take time to help Doodle learn. He sometimes gets frustrated trying to keep up with kids who’ve been doing karate much longer than he has, and isn’t very patient with mom and dad when we try to help…but if Ben or Bryce or Molly show him what to do, he actually pays attention and listens. Oh, and apparently they are teaching him to put away pizza like no one’s business. When I arrived at the party to pick him up, his coach told me she cut him off from eating pizza because after eating four or five pieces, she was worried he’d get a stomach ache. “Do you usually let him eat that much?” she asked. At this point, I’m wondering if she had the right kid, because it’s usually a fight at dinner to get him to eat half of a hot dog and two bites of corn. 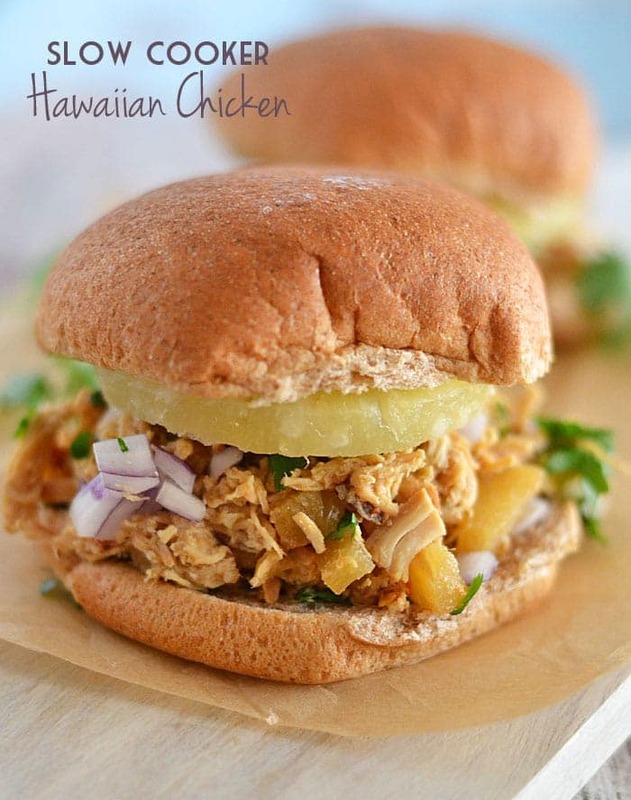 So when I made this Hawaiian Chicken the other evening and he ate an entire sandwich, I knew this recipe was a winner! It’s super easy, requires only a handful of ingredients – and you can serve it in many different ways: on buns, tortillas, or with rice or veggies. We like to add chopped red onion, chopped cilantro, and extra pineapple slices to ours. Place chicken into crock pot. Cover chicken with remaining ingredients, through the red pepper. Cook on low for 4 to 6 hours. 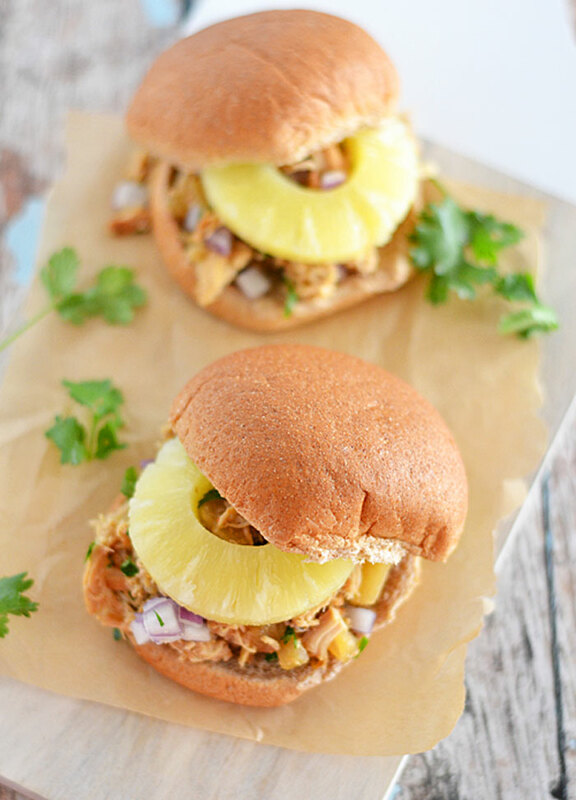 Shred chicken and serve on buns; top with additional pineapple, red onion and/or cilantro. 9 year old black belts–go them! That’s so sweet how the karate kids have taken Doodle in 🙂 These sandwiches look amazing–especially since they are made with a slow cooker!! Jamie: YES FUSS FREE, THE SLOW COOKER DOES ALL THE WORK!!!! This looks delicious- and easy! Thanks for sharing. A slice of pineapple is always welcome on any sandwich of mine. This recipe sounds wonderful. I love the crushed pineapple, lime, honey combo. And with red pepper flakes for some excitement, I’ll be making this one soon. Pinned and thanks for the recipe. Wow! That is an amazing group of kids! This chicken looks fantastic Ashley! Pinned! THIS RECIPE LOOKS WONDERFUL, CAN’T WAIT TO TRY. I ESPECIALLY TOOK NOTICE OF THE NAME DOODLE, I HAVE A 16 YEAR OLD DAUGHTER AND I HAVE ALWAYS CALLED HER DOODLE (NICKNAME) HER REAL NAME IS AMBER. SHE’S ALWAYS ASKING HOW I CAME UP WITH THIS NICKNAME AND I’M REALLY NOT SURE HOW IT CAME ABOUT. This was super easy to make, and was absolutely delicious! I’ll definitely be making these sandwiches again. Looks delish! Think it would freeze well too? This recipe needs something else, maybe a sauce? It was surprisingly bland. If it wasn’t for the cilantro and onion, it wouldn’t have tasted like anything. This was an OK recipe and I would not have made again except the kids loved it both nights we had it. I would drain the pineapple next time. It was really, really soupy. I had to cook for 100 people this week for our weekly end of Vacation Bible School volunteer appreciation luncheon. I needed something to fit into our “under water” theme so I picked this. It turned out beautifully! I used 20 lbs of chicken, 10 cans of crushed pineapple, juice from 10 limes, garlic, 2 Cups of soy sauce, and roughly 10 TBSP of honey. I used my giant roaster pan and cooked it at 200 for about 8 hours, then I shredded the chicken and discarded about 4-5 Cups of the leftover juice and then let it cook on the lowest setting for me that was 150 until noon. Everyone loved the chicken and it was a huge success. Thank you for sharing this recipe.